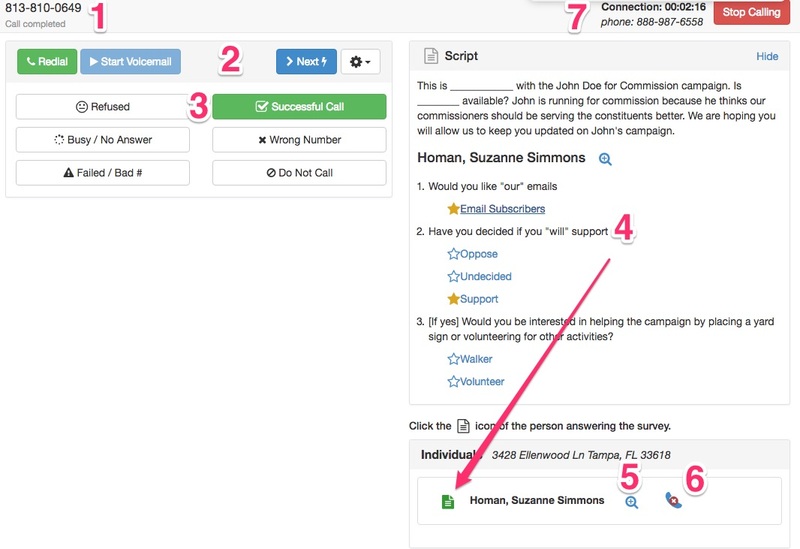 The integrated phone bank feature allows campaigns to efficiently contact targeted lists of voters via phone calls. 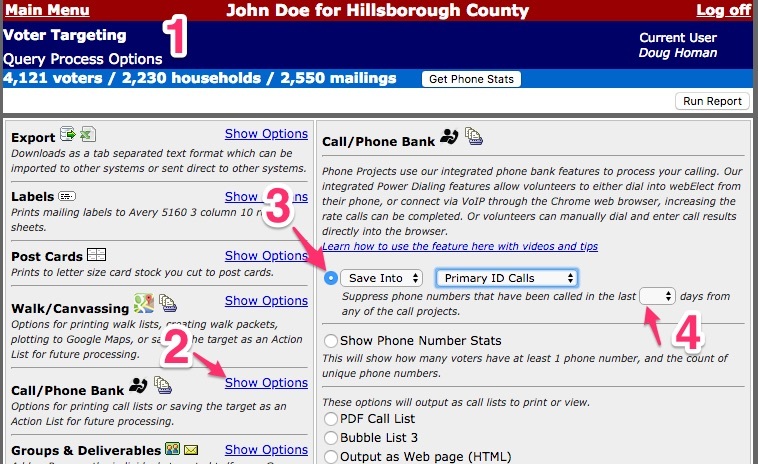 For more info on how to make calls using our phone banking feature, see the Making Calls page. We have also added a Ringless Voicemail feature that allows you to send a message directly to voters' cell phone voicemail. Volunteers log into the website or app, select that they want to make calls, and are presented with the lists (projects) they have been granted access to work on. Volunteers are limited to calling only during the hours the campaign has designated for each project. Once they have accessed the Calling screen, the system retrieves the "best" number to call from the list, serving up the numbers in descending order of accuracy score. This maximizes volunteer time by prioritizing numbers that are most likely to be good. Additionally, campaign's can choose to Enhance their phone number quality by running the list through our Premium Phone Append service. This processes the list through a 3rd party phone data vendor with daily updated data sources and increases the reach of the list by adding numbers to voters in which webElect does not have a number, adding newer numbers, and verifying existing numbers so they are prioritized in the calling order. Standard Dialing (included) - Volunteers use a telephone and manually dial the telephone number presented to them on the screen. The Caller ID displayed to the recipient is that of the phone being used by the volunteer. If an answering machine is reached the caller would need to leave the message. See our Standard Dialing video for a closer look at how it works. Power Dialing via Phone (2.9 cents/min*) - Volunteers use a telephone to dial into webElect and remain connected for the duration of their calling session. They do not need to dial numbers but simply click the "call" button on the screen. The Caller ID displayed to the recipient is whatever the number the campaign has assigned to use for that list, usually the campaign's office. If an anwering maching is reached, the volunteer clicks the "Start Voicemail" button on the screen after the beep and the designated recorded message is left while the volunteer can move on to the next call. See our Power Dialing video for a look at how it works. Power Dialing via VoIP (2.9 cents/min*) - Volunteers do not use a phone and are instead connected into the calling platform via the browser using VoIP and remain connected for the duration of their calling session. This works in Chrome and Firefox web browsers on desktops/laptops, Chromebooks, and Android (unfortunately Safari does not support this feature so iPhone users would dial in). All the benefits of Power Dialing via Phone are the same. See our VoIP video for a look at how it works. * Power Dialing is charged 2.9 cents/minute that the volunteer is dialed in via phone or VoIP to the system. There are no additional charges for the outbound calls to the voters. Charges are deducted from a campaign's Prepaid Credits. As the volunteers make each call, they are presented with the designated script to recite and a list of the targeted voters to speak to, as well as non-targeted voters that may share the number and answer the call. The volunteer then completes the specified survey form for the voter(s) and selects the outcome button indicating it was a Successful call. If an answering machine is reached and the volunteer is using Power Dialing, they click the "Start Voicemail" button at the tone. There may be other outcomes of the call, so buttons are provided for each allowing the volunteer to quickly update the system with the call results so the appropriate actions can be taken. Successful Call The call connnected and should not be called again. Number is marked complete across all projects. Start Voicemail Answering machine / voicemail answered. The project's designated recording is played. Volunteer is removed from call and can advance to next call. Number is marked as having voicemail left across all projects and will not be called again. Refused Answering party refused to participate in the call. Number is marked as Refused across all projects and will not be called again. Busy / No Answer Either a busy signal was detected or there was no answer after 60 seconds. The call attempt counter is incremented and updated across all projects. If 3rd attempt, number will not be attempted again. If under 3rd attempt, the number will be added back to the end of the queue after a 30 minute delay. Failed / Bad # A connection could not be made. This could be due to a temporary issue or to a permanent disconnect. The call attempt counter is incremented and updated across all projects. If 3rd attempt, number will not be attempted again. If under 3rd attempt, the number will be added back to the end of the queue after a 30 minute delay. Wrong Number Call connected but the targeted voter(s) are not reachable. The volunteer is prompted to click the "wrong number" icon next to each voter that is not reachable at that number. This flags the phone number as invalid for that/those voter(s). A future feature will allow any additional number for the voter to be called. Do Not Call Answering party indicates to not call the number again. The phone number is updated to DNC status across all projects and will not be attempted again. Voter's number to call and system's reported call status. Call control buttons and settings. Campaign's survey form for the selected voter. Access the voter's full profile to reference or add additional info. If the voter is no longer reachable at this number, flag it as a wrong number. Session timer and the phone number used as the Caller ID. Set the number to display to the voter as the caller id when using the Power Dialing feature. You must verify this is a phone the campaign can answer with a simple validation process. Set the hours that volunteers can access the project. Record/hear the message volunteers can drop into voicemail boxes when using the Power Dialing feature. Restrict access to the project to certain users. 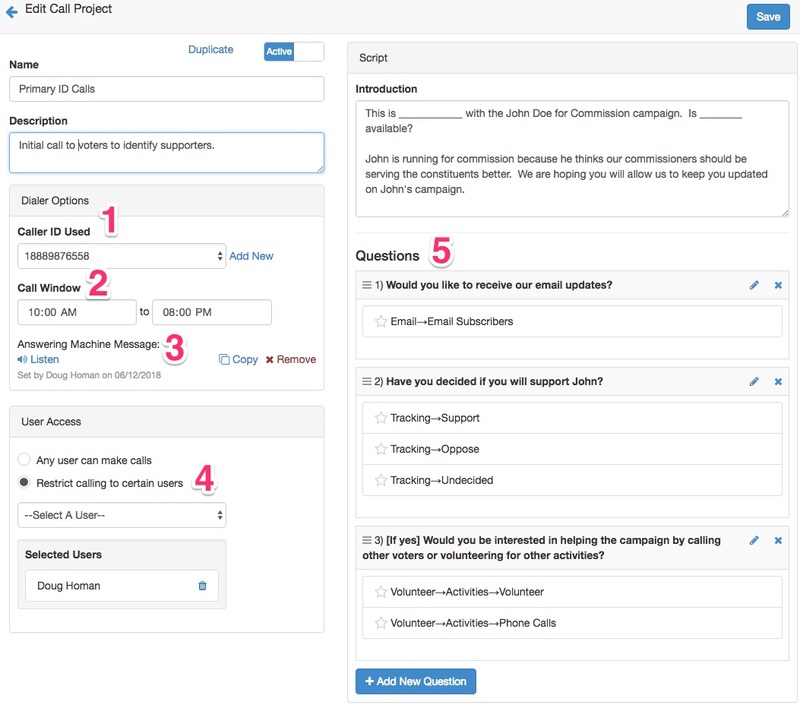 Go through the Targeting process to select the voters you wish to call. 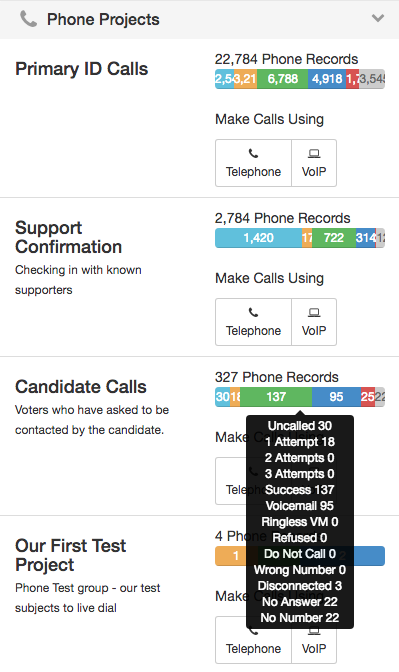 On the Process Options page, click "Show Options" for the Call/Phone Bank section. Select the radio button to "Save Into" and select the Call Project you have created, or select "Create New" if you have not yet created the project. If you already have calls being made in other projects, use the suppress option to prevent numbers from being called that have been called recently in another project.